different readings of the landscape of Scotland than their better known male contemporaries. Looking at their photographic and literary outputs, Jenny will present their aims, methods and examples of their work. This talk will also refer to the lantern slides of Werner Kissling’s mother, Johanna, who travelled as a tourist to St Kilda and Lewis in 1905. St Kilda’s inhabitants were regularly filmed and photographed, often as a curiosity of a ‘primitive’ way of life. 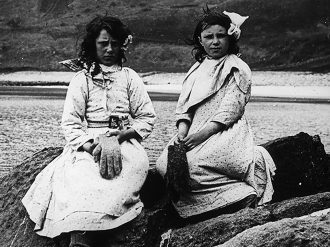 Johanna Kissling’s photographs will be considered alongside the approaches of Margaret Fay Shaw who visited the island in its last summer and Alasdair Alpin Macgregor, who was one of the official photographers for The Times, documenting the last days before the evacuation.